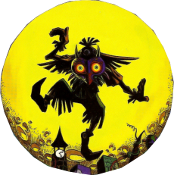 Majora’s Mask’s “epicness” comes from the game’s vast array of side-quests. Whether it be a side-quest for an upgraded quiver, a heart piece, or most importantly, a mask, the side-quests add an excellent aspect to the game. These side-quests play a major role in the main story, too. They give the player a better understanding of Termina and of how life for the characters is with only three days to live. The game basically revolves around the side-quests, and to fully enjoy the game, the player must become intertwined with the main story AND the side-quests. Because these quests are totally optional, they give the player a greater sense of accomplishment for completing one. For example, successfully completing the Anju & Kafei side-quest gets the player a few masks, and it can be completed twice; getting the Postman Hat the first time, and an empty bottle the second time around (or vise-versa). All of this along with a very touching story. And for completing ALL of the mask rewarded side-quests, the player will be granted with the greatest mask, and side-quest reward, of all; The Fierce Deity Mask! Majora’s Mask is a game well known for its character interactions. Because side-quests play such a large role in Majora’s Mask, that ultimately means that so do characters. Character interactions help make Majora’s Mask a great game by adding to the overall story. As the player completes side-quests and interacts with the characters, they begin to learn more about the characters and find that most of them are tied together in some way, adding to the overall story. Many characters in the game are in need of help and will offer great rewards when helped. Some character interactions can be as long as the tear jerking Anju & Kafei side-quest, where the player helps reunite two lost lovers; while others can be as fun as helping out Romani by fighting off aliens throughout the night; and while others can just be plain weird, like dancing with the Rosa Sisters. Whatever it is, character interactions can add great side-quests and stories to an already great game. The three day time cycle in Majora’s Mask added an interesting twist to the game. With it, players were limited to completing tasks in a certain amount of time which added a very challenging, but fun, aspect to the game. Luckily, Nintendo lightened the load a little bit by adding The Inverted Song of Time (slowing time 1/3 of normal time) and by allowing players to reset the three day time cycle every time The Song of Time was played. The time cycle also allowed the player to re-do quests and beat bosses again which was a fun addition. These are just a few of the reasons why the time cycle helped make Majora’s Mask a better game. The almost sole purpose of every Zelda game is to collect as many items as possible. Items range from weapons, to letters, to heart pieces, etc. In Majora’s Mask, the most common type of “item” are the masks. The masks add great depth to the game, allowing the player to change race, turn giant, or make their face explode! Most importantly, however, the masks serve as the key items in the story. 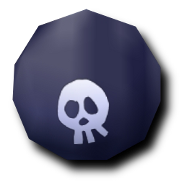 While the Deku Mask was a curse put on Link, to obtain the other two out of three main masks (Goron, Zora), Link must help out the spirit of the mask and allow it to finally “rest”. After doing so, the spirit lives on inside the mask which grants Link its power when worn. These masks also add an interesting aspect to the game-play, giving link three different major abilities. Each of the three masks gives link a new set of moves, and what I think is the coolest, a new instrument! And collecting every mask also serves a purpose. The collection of all twenty normal masks also leads to one of the most fun and powerful items in The Legend of Zelda; the Fierce Deity Mask. Majora’s Mask also included optional items and power-ups that could be obtained by collecting fifteen stray fairies in each of the four dungeons. 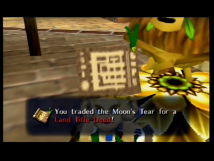 And as far as items, one thing that Majora’s Mask did not go light on was heart pieces. The game has over fifty heart pieces, making the quest for twenty full hearts seem almost endless! Finally, the last thing that I believe made Majora’s Mask a great game were the dungeons. Many players complained over the fact that the game only offered four dungeons; however, what I believe they fail to see is that the dungeons were some of the most fun, in-depth, challenging dungeons that Nintendo has ever created. They also all require the use of one form of Link. The Woodfall Temple started the player out with a thought provoking challenge, which was both fun and frustrating, and required the use of Deku Link. The Snowhead Temple continued with this trend, utilizing Goron Link by adding many ramps and big, fist-crushing boulders. And then, it appeared as though Nintendo stuck with The Legend of Zelda trend of making the water temple extremely difficult and confusing. The Great Bay Temple had an amazing layout, and it gave the player an immense challenge of figuring out puzzles using the pipes and water flow as a Zora. Finally, the masterpiece: The Stone Tower Temple! This is one of my all-time favorite Zelda temples, ever. The creative use of the temple flipping, the upside-down rooms, and seeing an upside-down chest and going “hmm..?” was amazing. And the music, incredible! Majora’s Mask definitely made up for its “lack” of dungeons by having four of the most well thought-out dungeons that The Legend of Zelda has ever had. one of the most well thought-out and greatest (although very controversial) Zelda games yet!